I’ve always wanted to hunt hogs and deer with an AR platform. Both are plentiful in Texas. 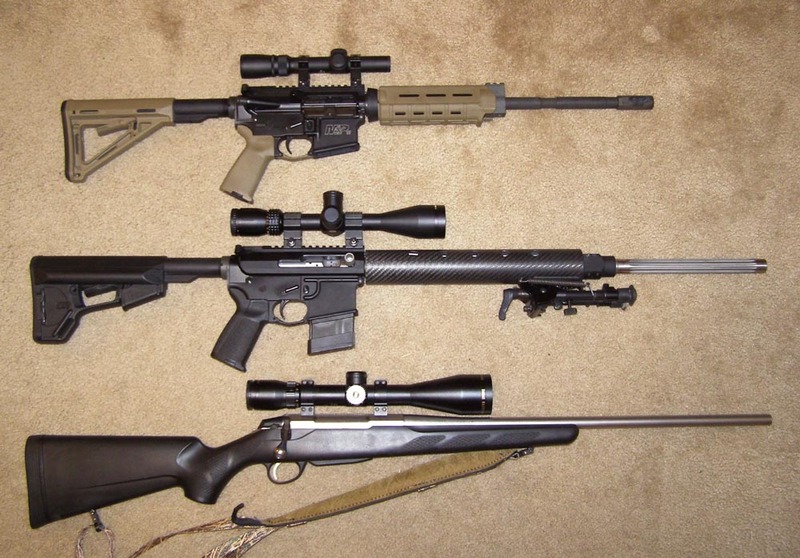 I should say all three, game and rifles, are plentiful in Texas. Both my ARs are .223/5.56 and I haven’t decided what upper caliber to place on my 3rd lower. I’ve shied away from hunting with my ARs due to the .223’s reputation as a “poodle shooter” – until this season. Two things have caused me to reconsider. First, Barnes and Hornady have just introduced heavy-for-caliber monolithic (copper/copper-zinc) bullets for the .223. 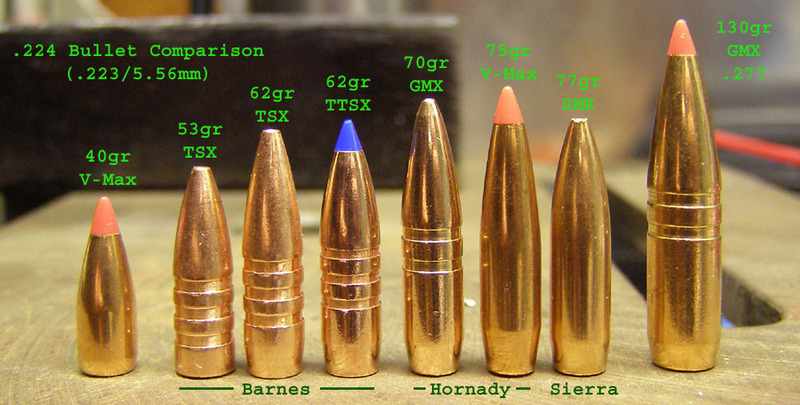 Barnes has a new tipped 62 grain TTSX and Hornady has a new 70 grain GMX hollow point. The GMX was so new I had to talk Hornady into selling to me direct because it wasn’t in area or on-line stores yet. Monolithic bullets are known for their deep penetration and ability to stay intact after impact – characteristics I feel are important with both these game animals. Some will argue that, because monolithic bullets have near-100% weight retention after impact, they are as effective in terminal performance as lead-core hunting bullets that are 20 to 30% heavier. Second, this Fall I witnessed the effectiveness of the Hornady 130 grain GMX (.277 diameter) fired from a .270 Winchester on elk at 200+ yards. It has made me think that an AR with a TSX, TTSX, or GMX bullet could be effective on hogs and the smaller 100-pound+ deer we have in Texas, at least out to 100 yards (I know many will take exception to this). I’ve included the 77gr SMK as a control to compare performance. It represents one of the heavier lead-core bullets that can be magazine feed and it has been exceptionally accurate for me. Also, Special Forces have recently been using this bullet effectively in combat. However, it fragments on impact which does not meet my objective for deep penetration. For this comparison, I plan to shoot my S&W M&P 16” (basically and M4 with 1:9 twist) and custom ARs with a heavy-duty Alexander Arms upper receiver with a 24” White Oaks Armament (WOA) barrel with 1:8 twist. The S&W is about 6.5 lbs sans scope, easy to carry and maneuver. The WOA is 8.1 lbs sans scope and deadly accurate. The WOA won’t be as nice to carry in the field but I expect to get velocities close to 3000 fps out of its 24” barrel. To approach that speed with the S&W’s 16” barrel, I’ve also included the 53gr TSX loading for this rifle. I was pleased to notice that my 24” WOA AR, though heavier, wasn’t any longer than my .270 Win Tikka T3 Lite with its 22.875” barrel. For preprimary testing, I loaded up three shells for each test point in the matrix below using 0.5 grains below max just to get started. I used Varget with all the loads following the Barnes manual as appropriate. As far as I am aware, Hornady does not publish GMX load data and recommends using load data from one of their equivalent BTHPs. They did caution me to start conservative with their new 70gr GMX. I shoot their 75gr A-Max so used that loading as a starting point. This preliminary testing will let me establish velocity/energy potential for each rifle-bullet combination. Bullet stability is also a consideration especially for the .223 which has such a variety of twist rates. A 1:8 twist is optimum for these longer bullets. All the stability factors (SF) listed in the table above are based on 10-deg F temperatures and are calculated using the Don Miller equation. I used 10-deg F as colder temperatures equate to denser air and resultant lower bullet stability. That’s about as cold as I plan to hunt. Most recommend a bullet SF of 1.4 for hunting inside of 500 yards with a minimum SF of 1.1. You can see that the SF for the 62gr bullets with the 1:9 twist is pretty low – some would say too low. Stability is another reason I included the 53gr TSX in the 16” because it would be adequately stabilized with the 1:9 twist. Note, Barnes does recommend a 1:8″ twist or faster for the tipped TTSX. You will also notice that Hornady’s.224 GMX doesn’t have a ballistic tip which their other GMX bullets have. They confirmed their weight goal could not be met and still have the bullet stabilize in common AR twist rates. BTW, the longer the bullet, the less stable it is as seen by comparing the 62gr TSX and with the longer 62gr TTSX bullets. 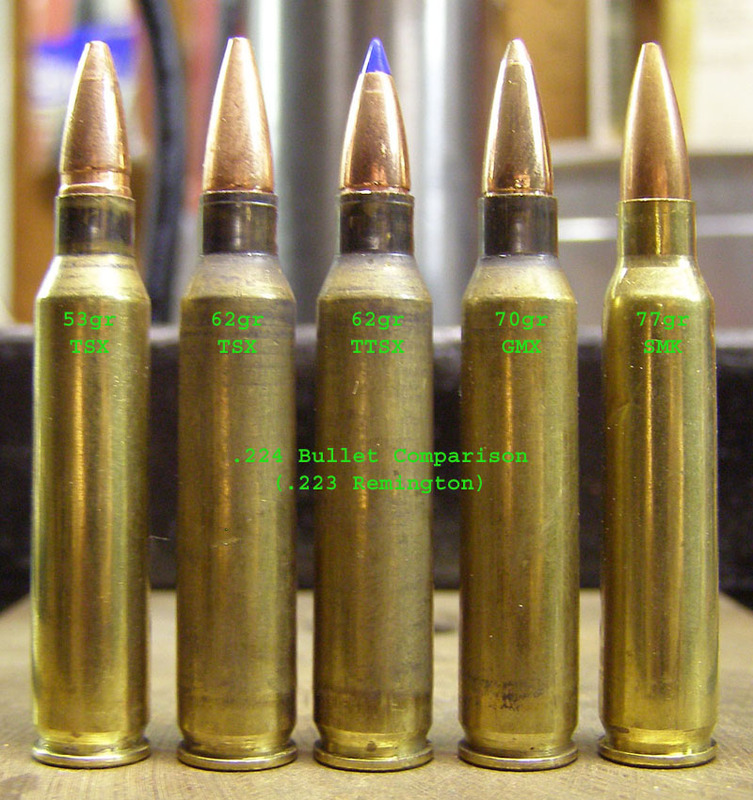 A lighter bullet is also less stable as you can see by comparing the 62gr TTSX with the 77gr SMK. The TTSX is slightly shorter (better for stability) but significantly lighter resulting is noticeably less stability. As the bullet travels down range, its stability increases. When considering SF, however, the Miller equation is conservative. I found this out when I contacted Hornady regarding their 130gr GMX in my.270 Win which had, according to the Miller equation, a SF of less than 1.1 at temperatures below freezing. Hornady confirmed the 130gr GMX bullet remains stable down to -15-deg F temperatures with a SF of 1.1. They use a more sophisticated aero-ballistic modeling equation, called PRODAS, and have encountered no complaints regarding stability in the 3 years this bullet has been in use. Just because my 130gr GMX bullet is stable when the Miller equation says it shouldn’t be is no guarantee that these longer Barnes bullets will be with a 1:9 twist in my AR. Still, I thought I would give it a try. Well, I have them all loaded up. Time to go to the range! I want to get there early. This will be an interesting one to follow Slim. I must admit, I am one of those that feels the .223/5.56mm is a marginal calibre at best for deer sized game (from experience). I too have been considering the monlithic bullets for my .243 Win, but at this time I don't shoot enough to probably warrant the expense...that plus the Remington bullets I am loading are doing a good job. You have adopted a very thorough approach to this testing and I'll be awaiting your results buddy. I think this is a pretty interesting experiment! I'd try a .223 on hogs or deer but only under very limited circumstances. However, if I wanted a "hog/deer AR" my personal preference would be to use a "heavier" cartridge. I will be waitng the results but my pre data hypotheis is shot placement overides bullet performance...No doubt you could and will cleanly take a deer or a hog because you will put the bullet where it needs to go with your tools and abilities. With the relative low cost of a new upper, I think the 6.8 SPC or similar class AR case would be my choice for a Hawg/Deer AR platform. I have not done the side by side comparison with the heavier .223's but my gut says they will carry more energy a longer distance. even a 7.62x39 does a number on wild pigs..... under 150 yards. A .450 thumper would be a good brush gun AR choice too. I am also very interested in the results of your trials. Also, and please understand I am not trying to pirate you post, but I have avoided going to the AR platform because of a preconceived notion that accuracy is compromised and that the single shot bolt action is more accurate at ranges beyond 60 to 70 meters. I like one shot one kill. On the other hand given the accuracy I would love the autoload and firepower of the AR platform, not necessarily for wildlife, just say---- cause it looks like fun. Like I said before.......I'd go after deer with my 221 if I had to and not think twice !!! Just got to know your limitations !!! Take your camera and get pics of the damage. (heart, lungs, etc.) Feel free to PM them if you think they're to gory for posting. Lester - I shoot my iron sighted AR under 1 moa at 300 yards. Is that good enough? the rifle is capable of the same at 600 yards in a highmasters hands - I only hold about 2 moa out there. seriously the 110grn copper job out of a semi has to be deer medicine made to order. I too am interested in the results although I use a bolt action 223. I have not yet gone beyond 60 grain pills so am keen to hear results with the heavier loads. My .02 : small pigs to 90#- eye, or ear from above and behind. Get close. Bring back-up (12/20ga slug or 44m with a Punch bullet). That's a lil pill being asked to do a lot on walking bullet traps w/ tiny vitals and tons of armor- yuo might zip one in there but...and all bets are off with Russian boar w/ a .223 Rem. Out here on high-fence hunts ya need 308Win or better in rifle, and, some places say 44m not allowed on boar over 60#.